Christmas has only just taken place and we are already thinking about the baptism of Jesus - Why? Well Jesus has been born, but who is he? If he is the Son of God, then why is he here, what is his purpose on earth.? The baptism of Jesus marks the time when Jesus sets out on his public ministry. He chooses to do so not in the religious establishment, but rather at the hands of a man outside the system, somebody who will soon be executed. Jesus is making a statement, that he brings something very different from the religious norm. Jesus is standing alongside the ordinary people in the desert, not with royalty in the king's palace. Moreover at the baptism we hear the voice of God, Jesus has chosen well, and God gives him the Holy Spirit to empower him for the task ahead. This is the time of year when we remember how Jesus demonstrated his commitment to the ministry to which he was called. We are told that it was while Jesus was praying that the wonderful events occurred. The miraculous Baptism was not something out of the blue, but rather something to confirm what Jesus had known all along. We know this from the events last week where Jesus went missing at the age of 12. He knew that he was in the right place when he was found in the temple. Jesus has spent two decades growing in his understanding of the service which he knew he must offer, and the sacrifice which he knew he must make. Here is the baptism experience to affirm him in his role and prepare him for the journey ahead. As we affirm our baptism vows, we too should expect the energy of God to be present in our lives. Perhaps we too will hear that quiet voice inside which tells us that God is with us and will empower us to walk the path which he has set before us. Eternal Father, who at the baptism of Jesus revealed him to be your Son, anointing him with the Holy Spirit: grant to us, who are born again by water and the Spirit, that we may be faithful to our calling as your adopted children; through Jesus Christ your Son our Lord, who is alive and reigns with you in the unity of the Holy Spirit, one God, now and for ever. Amen. Thus says the LORD, he who created you, O Jacob, he who formed you, O Israel: Do not fear, for I have redeemed you; I have called you by name, you are mine. When you pass through the waters, I will be with you; and through the rivers, they shall not overwhelm you; when you walk through fire you shall not be burned, and the flame shall not consume you. For I am the LORD your God, the Holy One of Israel, your Saviour. I give Egypt as your ransom, Ethiopia and Seba in exchange for you. Because you are precious in my sight, and honoured, and I love you, I give people in return for you, nations in exchange for your life. When the apostles in Jerusalem heard that Samaria had accepted the word of God, they sent Peter and John to them. When they arrived, they prayed for them that they might receive the Holy Spirit, because the Holy Spirit had not yet come upon any of them; they had simply been baptized into the name of the Lord Jesus. Then Peter and John placed their hands on them, and they received the Holy Spirit. The people were waiting expectantly and were all wondering in their hearts if John might possibly be the Christ. John answered them all, "I baptize you with water. But one more powerful than I will come, the thongs of whose sandals I am not worthy to untie. He will baptize you with the Holy Spirit and with fire. His winnowing fork is in his hand to clear his threshing floor and to gather the wheat into his barn, but he will burn up the chaff with unquenchable fire." And with many other words John exhorted the people and preached the good news to them. But when John rebuked Herod the tetrarch because of Herodias, his brother's wife, and all the other evil things he had done, Herod added this to them all: He locked John up in prison. When all the people were being baptized, Jesus was baptized too. And as he was praying, heaven was opened and the Holy Spirit descended on him in bodily form like a dove. And a voice came from heaven: "You are my Son, whom I love; with you I am well pleased." 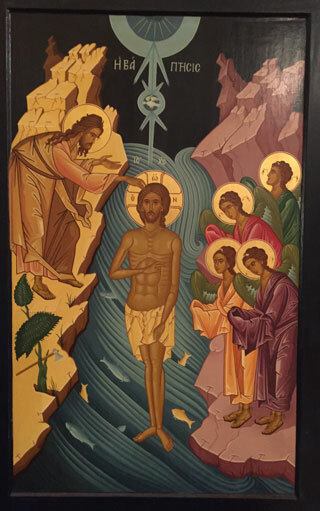 Lord of all time and eternity, you opened the heavens and revealed yourself as Father in the baptism of Jesus your beloved Son: by the power of your Spirit complete the heavenly work of our rebirth through the waters of the new creation; through Jesus Christ our Lord. When Jesus was baptised he posed an interesting question for Christians. The baptism of John was about repentance and the forgiveness of sin, why then would Jesus be baptised? Various reasons have been given for Jesus' submitting to the ritual washing. Some think Jesus was manifesting a strong consciousness of sin and its effects on humans. Others, that Jesus was showing God's approval of John's ministry to the people. There are those who believe Jesus was a disciple of John and in accepting baptism Jesus was taking the first step towards establishing his own ministry. He may have been taking the first steps away from John and on his own. But, think about Jesus' being in the same water the crowd had just left. He gets wet with water that touched them and what they left there with John's baptism. Think of what they brought down into the Jordan, what was clinging to them. Not just the sins; but the pain of their lives; the struggles against the big evils that surrounded them--- terrorism, crushing taxation by a foreign power and daily fears of unpredictable violence. What burdened their hearts when they went into the water? Did they wonder what God was doing to help them out of the mess of their lives--- their dyings, the crippled children, the feeble elderly, the deaths from painful sickness? What about their feelings of inadequacy for not being able to provide enough food for their families or to protect them from the vagaries of daily life? Did they feel they hadn't done enough for God or taken God seriously enough? Wouldn't we want Jesus to join us in the places we feel most frail, pained, inadequate and sinful? Jesus does not remain aloof from us, judging us from on high. He comes right to where we are gathered with all our burdens and takes them up into himself, as we wait upon the Holy Spirit in prayer. The descent of the Spirit upon Jesus is not just about Jesus, just as our baptism is not just about our personal relationship with God. We are baptized into a community. We share together a creed, a history, and a struggle to make that faith real in the world. The Spirit calls us into community and is present in the community. God does work in spectacular ways; but if we look for spectacle we most often will be frustrated. In this episode Jesus makes an anonymous entrance that the crowd missed, even though they had been "filled with expectation." Even the voice from heaven is not a public broadcast, but a voice directed to Jesus. It will take the Spirit's gift of fire to burn away the veil over our eyes and our false expectations to purify us so that we notice Jesus' daily entrance ---there among the ordinary, especially the downcast, people. Some voices are unforgettable. If I mention the name ‘Edith Piaf’, a whole generation will straightaway recall the haunting, desolate beauty of her voice. In our own time the voices of Bryn Terfel and Katherine Jenkins have similar effects - that spine-tingling “something”, indefinable, never to be forgotten. Other voices, less famous, remind us of childhood, or adolescence, or times when we were either extremely happy or very sad. Imagine now the voice of God. In the Bible there are times when the poets compare God’s voice with the sound of an earthquake (the ‘foundations shook’), or the sound of ‘many waters’. The effect is of awesome majesty and power. At other times, however, the voice of God is described as quiet, intimate and very close. This Christmas, as indeed every Christmas, God speaks to us through the stories of the birth of the Christ-child. The voice of God is tender, and very, very beautiful, calling to each one of us to enter the truth that the stories reveal. Let me put it like this. When I hear a voice from my own place of birth - on the Welsh borders, I experience a pang of homesickness; a deep and sudden longing for the place where I was born and the people with whom I grew up. The place has, of course, changed and many of my family are no longer alive - but the sounds of that place, the sounds of those voices, continue to lie deep within my memory, and the yearning, the longing, are stirred. The Germans refer to this longing in their word ‘Heimat’, and the Welsh in their word ‘Hiraeth’. It is a deep and poignant longing for a place and a people. Such a longing does not always look backwards: think of the voice of your husband or wife or child or a friend. Their voices too are vibrant with the same kind of intense beauty; the same haunting loveliness. And so it is with God. At Christmas, amongst all the noise and hullabaloo, if we listen deeply to the silence of our innermost souls, we shall be met by God. He calls us to simply be with him as he is with us in Christ Jesus. The voice of God is the voice of one who calls each of us to our eternal home. He is the source and the destiny of the longing in our souls. Let us worship the Christ who draws near to each of us. Let us praise the Christ who loves the worst among us. Let us bless the Christ who shares with the least among us. Let us glorify the Christ who intercedes for all among us in the presence of God the Father. Amen. For the unemployed who cry out for work but do not find it. Forgive us, Lord, if we unwittingly share in the conditions or in a system that perpetuates injustice. Heavenly Father, we pray for all of those who have confessed your name in baptism and we remember especially those who experience persecution for their profession of faith. Give to your people repentance for their sins and the strength of your Holy Spirit to live lives worthy if our calling by you. We thank you Lord God that you promise to us the power of the Holy Spirit to work within us to guide us in your ways and strengthen us in your service. May we never be proud of our own achievements, may we never be overwhelmed with the challenges which face us, recognising that in all things it is your strength which works in us. Whatever we may have to endure or enjoy, we thank you that you walk with us on a known way. We pray for those who have troubled lives. Those who are addicted to harmful things which threaten their lives, those who lives have been badly damaged and broken. Lord Jesus we know that you reached out to those who lives had hit rock bottom and your touch brought forgiveness, healing and change. So we ask that you would enable us to be your healing touch among those who have not known the power of your love. Give us your willingness to be alongside those who suffer and who are in need and may we be faithful messengers of your good news. and give us the strength lovingly to surrender our strength to your perfect will. John the Baptist was a Jewish prophet who preached and practised a baptism of repentance in anticipation of Jesus’ ministry. The Gospels note that ‘all’ came to hear him, such was the appeal of his message and act of baptism. Luke’s gospel associates John the Baptist—who was miraculously born to Zechariah, an elderly priest, and Elizabeth, his wife—closely with Jesus as his cousin. It is thought that prior to his ministry John may have had connections with the community at Qumran in the Judean Desert. In common with community members John had priestly connections, believed in imminent divine judgement, opposed Jerusalem and the Temple, and used water in a special ritual way. John’s work anticipated and overlapped with that of Jesus. His public ministry began c28AD and was a passionate call to baptism, to people to repent before the wrath to come overwhelmed them. Once he had received his prophetic calling from God in the desert area along the Jordan Valley, John dressed in the clothes of a prophet, camel hair, with a leather belt around his waist and ate locusts and wild honey. The location of the ministry of John is significant. The wilderness was a place of new beginnings away from Jerusalem and the Temple. John’s teaching forgiveness through baptism rather than making sacrifices only increased the distance between John and organised religion. John saw himself as a precursor to Jesus, and his baptism as an anticipation of the baptism of Christ with the Holy Spirit. John called for repentance based on the broad principles of the Jewish Law, rather than narrow concerns. He was unimpressed by racial or national identity. Among those drawn to John was Jesus, whom John baptised in the River Jordan. Only in Luke’s Gospel do they work together for a while as members of the same renewal movement in which Jesus meets his first followers. John’s initial expectations of Jesus were disappointed. John wanted to see great judgement rather than teachings about salvation and forgiveness. After his imprisonment by Herod, John even went so far as to send disciples to Jesus to ask him directly whether he was the Messiah. Jesus had no doubt as to the importance of John, his ministry marked a transition between the old age and the new. For Jesus, John the Baptist was the greatest prophet—perhaps even Elijah whose return would herald the Lord’s coming. John later taught in the region of Galilee where he was arrested by Herod Antipas and the executed for publicly criticizing Herod’s marriage to his sister-in-law. John prepared the way for Jesus by paying the ultimate price for speaking against the authorities. Paul was later to meet disciples of John the Baptist in Ephesus. Today's final verses use the moment of Jesus' own baptism to depict his unique, unmistakable identity. Note that the miraculous moment of identification does not occur when Jesus comes out of the water. It occurs after the fact, when Jesus is "praying." In Luke's gospel, the most revealing and empowering moments in Jesus' ministry occur during times of prayer (Luke 6:12; 9:18, 28; 22:41-42). During this moment of prayer, Jesus receives the Holy Spirit, the gift that marks the beginning of his messianic, Spirit-filled public ministry. A Prayer of the Ancient Church: Come, O Holy Spirit, come! Come like Holy Fire and burn with us. Come like Holy Wind and cleanse us. Come like Holy Light and lead us. Come as Holy Truth and teach us. Come as Holy Love and enfold us. Come as Holy Power and enable us. Come as Abundant Life and Fill us, Convert us, Consecrate us, Until we are wholly thine. Come, Holy Spirit, Come!